Hi, So Much Better With Age readers! 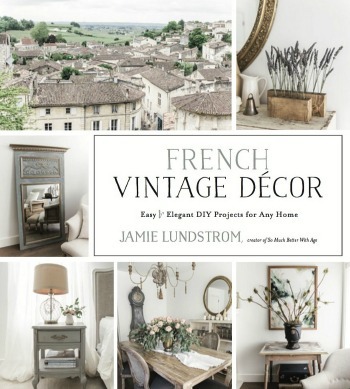 I’m April, and I blog over at House by Hoff about how I decorate on a budget with old junk and spray paint. (Ha! I think that should be my new tagline.) I am a wife, a mom to my spirited three-year old daughter, a reading teacher, a photographer, and a blogger. As you can imagine, I’m up late blogging and editing photos, sipping wine, and watching trashy reality shows most nights. What can I say…it’s just what I do. 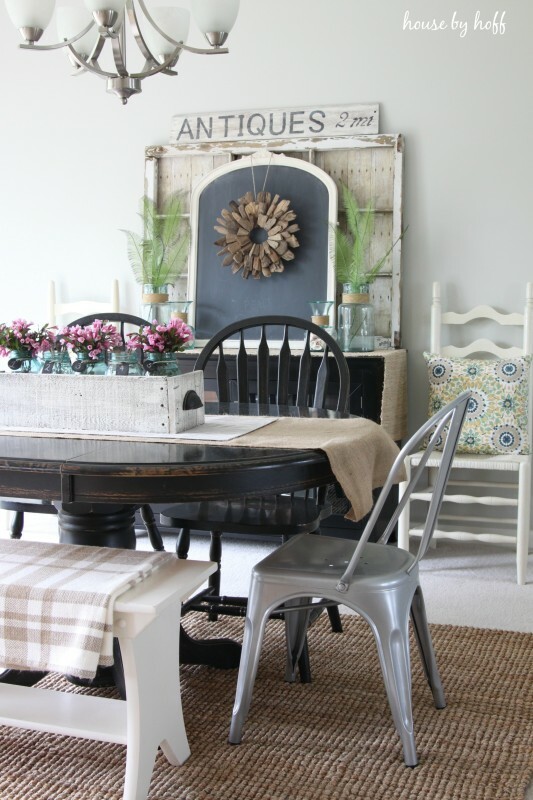 I’m here to share my summer dining room with you today! This dining room is really more of an “eating area” off of the kitchen. It’s a space that has evolved a lot in the last year. As soon as I added the jute rug and industrial chairs, it started to feel like a much more accurate reflection of my style. 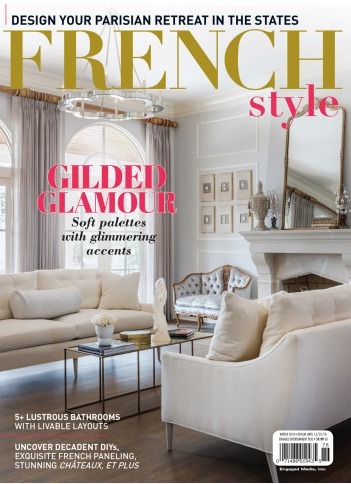 Isn’t it amazing how a few accessories can completely make a room? My husband and I made this DIY Pallet Wood Box last January. I love it’s versatility! 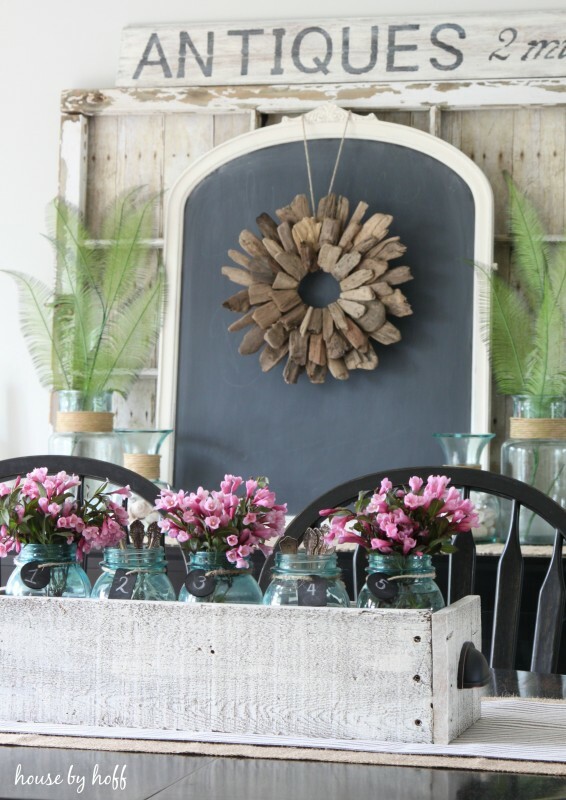 It works with every season by simply switching out what I put in the ball jars! I love using seashells and beachy accessories in my summer decor. The driftwood wreath was not a DIY, but a recent find from Marshall’s. A few years ago I didn’t dig the wood look, but now I adore it! 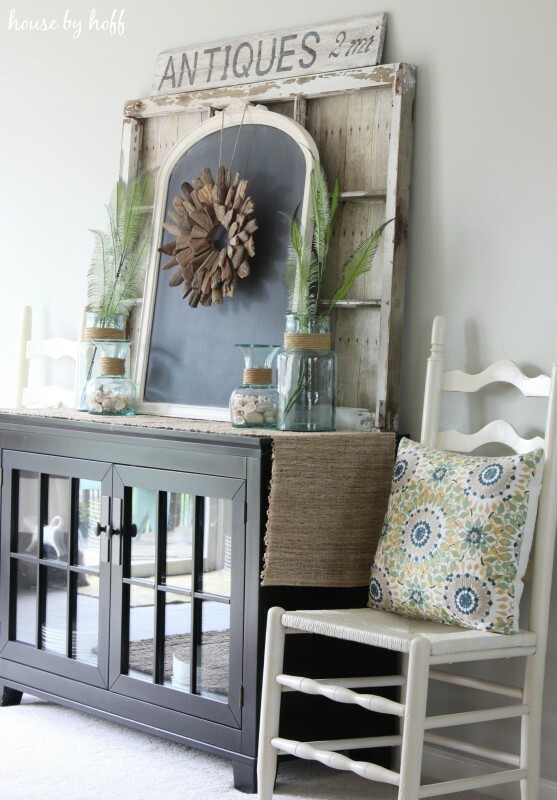 You’ll find industrial, beachy, and rustic style infused everywhere around my house. I hope you enjoyed my tour! 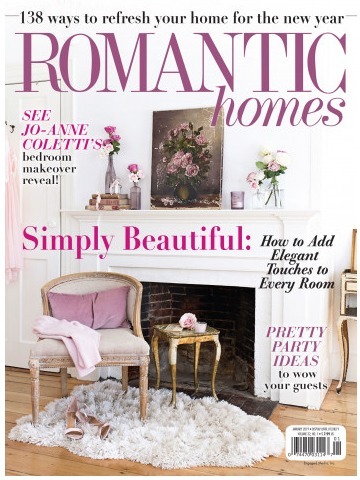 Please stop by House by Hoff, check out my Project Gallery, and take my Home Tour! I am looking for industrial chairs like the ones in your dining room! Could you tell me if they are comfortable to sit in and where you got them? I have looked all over our area and no one carries them in stock. I hate to order 8 of them without first or second hand experience! Thank you! I’ll get April to answer this for you, Janet! Hi Janet! They are from overstock.com (see link at the end of this post.) I love them, and they are a great value at this price! So glad to have found you via Jamie’s blog. Your dining room is fabulous–you have such a nice mix of styles and right now it really has a great summer vibe! 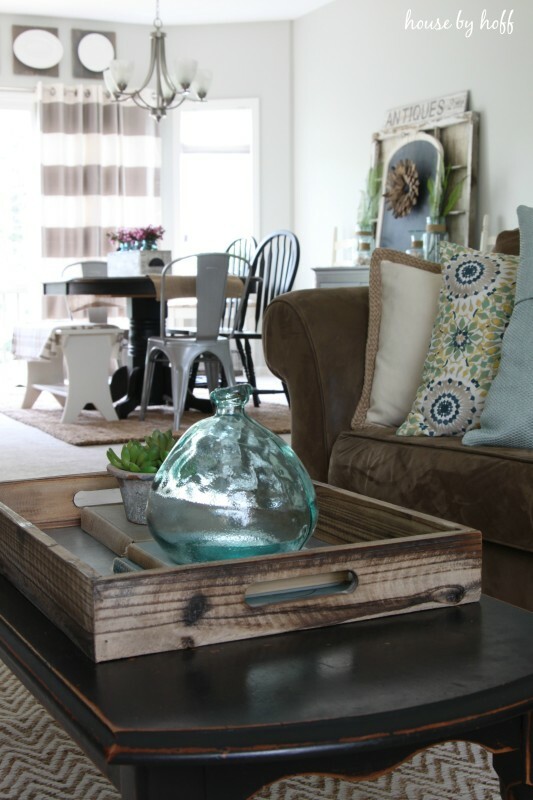 Love the pallet box on your table. And I’m glad to see darker wood being brought back into play. I think it adds a good balance in every room. SO pretty!!! 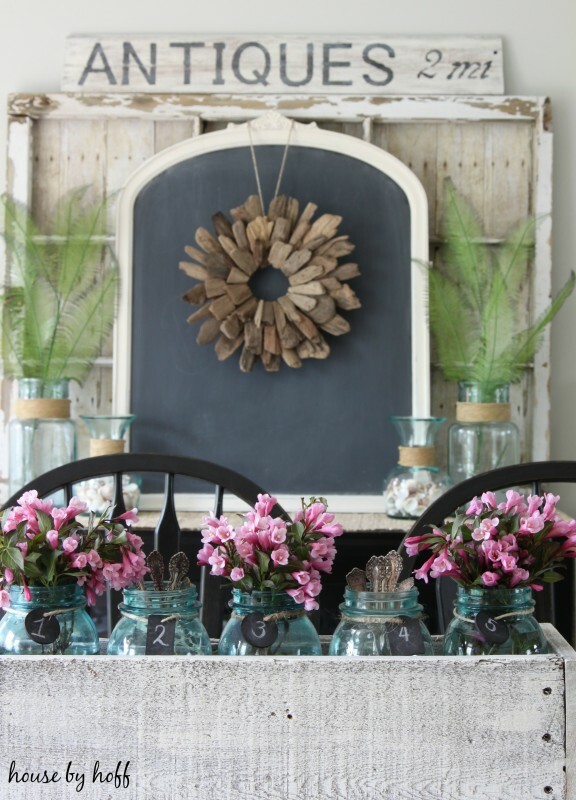 Love the mason jars especially with the little chalkboard tags! Have a great weekend, ladies! Love the character it brings to the space. Just beautiful!